• Six (6) position Tool Changer standard. 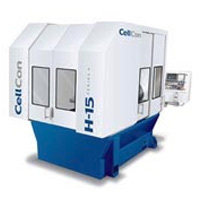 • Full Fourth axis contouring rotary table available. Speed: 0-2000, 3000, 6000 RPM Std. Change Time Tool: Tool 5.5 sec. Change Time Chip: Chip 7.5 sec. 24″X 21″X 18″ work envelope, 15-hp, ISO 40 taper spindle standard with 2000, 3000, or 6000 RPM. Feedrates to 600 IPM (15.24 MPM). 6-tool ATC standard with optional 12-tool ATC. Specify the optional 4-position index table for increased productivity. Fourth axis rotary table available for contouring. Fanuc CNC and drives. 24″X21″X18″ work envelope, 15-hp, ISO 40 taper spindle standard with 2000, 3000, or 6000 RPM. Feedrates to 600 IPM (15.24 MPM). 6-tool ATC standard with optional 12-tool ATC. Rotating double-ended table mounted on Hirth coupling in front of spindle permits loading/unloading during machining cycle, eliminating a major source of downtime. Table holds 220 lbs per side with 3.5 sec index. Fanuc CNC and drives. Generous 24″X21″X18″ work envelope for each of the two opposing spindles, allowing simultaneous machining of two sides of a part on a single setup. 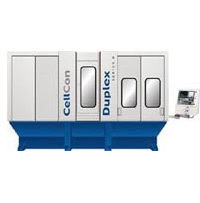 Each spindle runs independently or synchronously through GE Fanuc Cimplicity CNC. 15-hp, ISO 40 taper spindle standard with 2000, 3000, or 6000 RPM. Feedrates to 600 IPM (15.24 MPM). 6-tool ATC standard with optional 12-tool ATC for each spindle. Specify the optional 4-position index table for increased productivity. Fourth axis rotary table available for contouring.